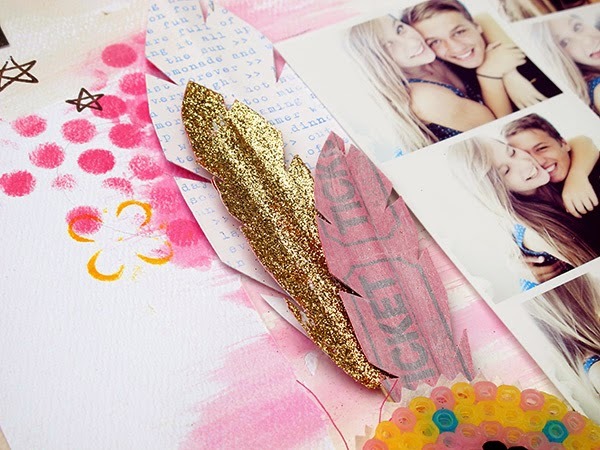 kim watson ★ design ★ papercraft: Crafty ways with everyday products! Crafty ways with everyday products! Yes...it is the week of LOVE! Yes... it is commercialised......but let's be honest it is fun, and you can be assured, your loved ones on the receiving end of your love gifts & spoils are surely not going to be complaining about commercialism hehe! The page I am sharing is a scrapbook layout as published in the Feb 2014 issue of Paper Crafts & Scrapbooking magazine. It is about our cute daughter & one of her (boy) BFF's. Their love & support of each other in an age where life puts so much pressure on one, is refreshing & sweet! Worthy of a scrapbook page. 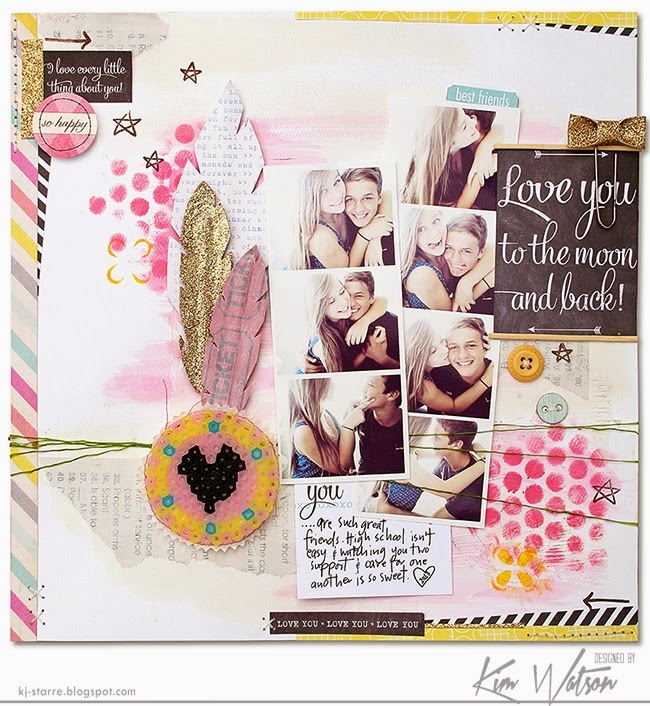 Love you to the Moon by Kim Watson: Supplies: Cardstock: American Crafts; Patterned paper: +Heidi Swapp, Elle's Studio; Tags & Stamps: Elle's Studio; Buttons: +Fancy Pants Designs; Glitter: Martha Stewart; Mist, Gesso, Ink and Texture Paste: +Ranger Ink; Pen: +Kuretake ZIG ; Adhesive: +Thermoweb, +TombowUSA ; Stencils: The Crafters Workshop; Cutting mat, Scissors, Trimmer by +Fiskars ; Buttons; Other: Black charcoal pencil. When creating this page....I was challenged to use everyday...ordinary things found at home & in your junk drawer. I gesso'd a bunch of tickets from the strip to knock back the red color, & created paper feathers in different sizes. One I left as is, the other I covered in liquid glue & dredged in fine gold glitter. Gorgeous!! See the little wooden frame around the sentiment card? I used a bamboo coaster mat, undid it and used the thin bamboo sticks as the supports for my feathers & frame. I took my extra minty dental floss & dyed with lime green mist...it became a super color accent for the layout, which I looped & tied across the page. Using a kiddies art mat & beads, I created a 'love' inspired accent which when ironed melted & sealed together. Using zig-zag scissors, I cut the ironing sheet into a circles, stitched it & matted the bead accent on top. The discarded bead template came in real handy to add 'comb-like' texture to texture paste onto the background before misting & inking. I tore dictionary pages into quarters & gesso'd them onto my background page for texture & interest. Left white, I used the dental floss to stitch buttons & hand stitching areas for added interest. Ok...let me say....as bizarre as this challenge was...I loved it. It stretched me creatively & I loved every moment of designing it.